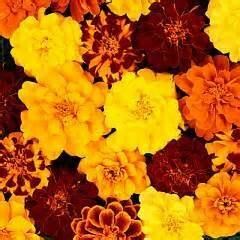 Tagetes patula mix is our popular and most-loved Marigold mix that is easy to grow from seed and easy to maintain. This mix has blooms that reach 8 - 12 inches in height and produces masses of blooms in shades of yellow, orange, and bi-color. Butterflies love these flowers! The plants are small, bushy and compact making them perfect for edging borders and for containers. When planted in a mass grouping, the color is magnificent! Marigolds perform from late spring through frost, and with some deadheading, the blooming will continue to be heavy. They perform well even during the intense heat of summer. Start the seeds indoors 6 - 8 weeks before the end of frost season. Press the seed into the soil and lightly cover with soil. Keep the seed moist. With a temperature of 70 - 75F, germination is usually within 20 days. 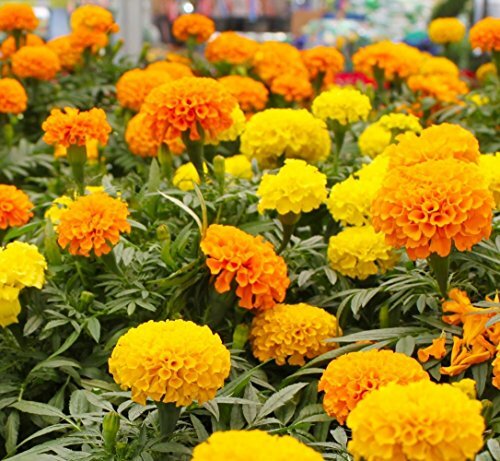 Marigolds can bloom from seed in 8 - 10 weeks. Transplant outdoors after danger of frost has passed. Space the plants 8 inches apart. Grow in full sun and in moist, well-drained soil. Marigolds are usually resistant to deer. Orange and Red-Orange Marigold - 6-18" Tall. Full Sun. Here is an attractive flower that you can grow in a container. Makes a great cut flower and is an awesome companion plant to keep pests away. 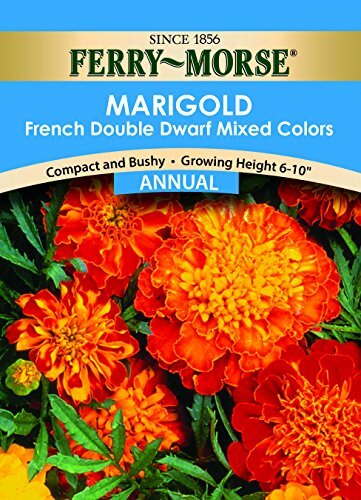 It doesn't matter how you choose to use it; all that matters is that the French Sparky Marigold will get the job done, and look great while doing it. 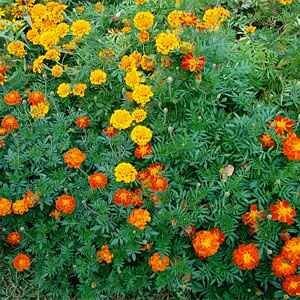 African Marigolds Crackerjack Mix -Tagetes erecta- Great for Vegetable Gardens! Some of the biggest blooms of all the marigolds, reaching 4 inches across on large 24 to 30 inch tall plants. These yellow and orange blooms reach their peak in the fall when they are widely used for Halloween and Dia De Los Muertos celebrations. Who says quality and quantity don't mix!? We want to give you the biggest bloom for your gardening buck, that's why we put over 1 full ounce of seeds in our packets. That's more than 10 times the amount you'll get in a store-bought packet! That's also why we only sell the freshest seeds available. Each packet is filled with our continuously rotating stock of wildflower seed, ensuring that the packet you purchase holds fresh seeds ready to plant for the current growing season. GUARANTEED TO GROW We're so confident that you'll have success with our seeds that we guarantee they will germinate or we'll give you a full refund within 30 days of purchase. These beautiful flowers require little maintenance once they get going. They tolerate different soils and climates well and add a splash of color to any garden or home. 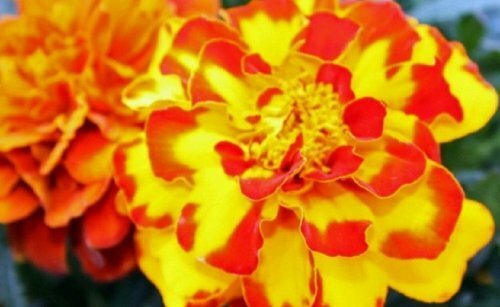 Tagetes patula nana, or also referred to as French Marigold, is a showy annual that is one of the most popular for planting in flower borders, edging the vegetable garden, and in window boxes and all sorts of containers. 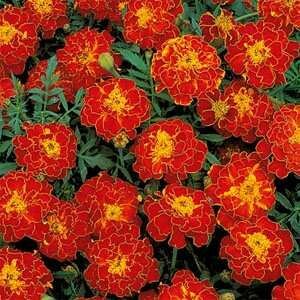 This variety, Champion Flame, is a compact, dwarf plant with double-crested, bi-color blooms of red and orange. To promote continuous blooming all summer long, Marigolds benefit from having the spent blooms deadheaded. 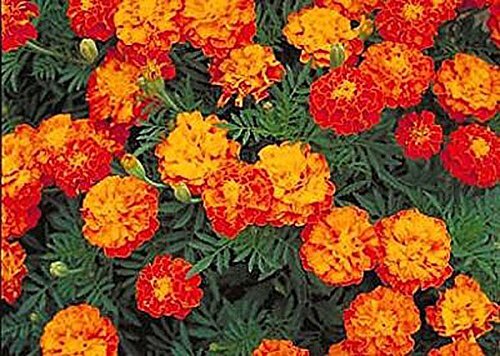 Grow Marigolds in full sun and they will nearly glow all summer long! In spring, start the seed indoors 6 weeks before the end of frost season. Press the seed into the soil, lightly cover it, and keep it moist. With a temperature range of 70 - 75F, germination is normally within 21 days. Space the plants 8 inches apart. 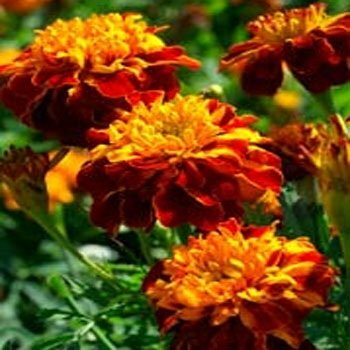 After danger of frost has passed, Marigold seed can be started directly outdoors. They will bloom about 8 - 10 weeks after planting the seeds. Tagetes patula nana, or commonly referred to as French Marigold, is a treasured annual that brightens up any landscape setting. This variety, Double Brocade Red, is 10 inches in height and produces bi-colored blooms in colors of red and yellow. The blooms are semi-double and flat. These are perfect for the front of the border or in containers and window boxes. 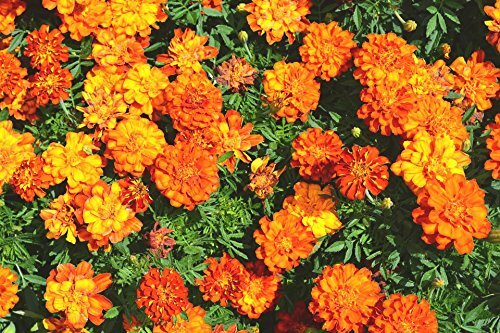 Everybody loves Marigolds, and they are easy to grow and easy to maintain! They perform from late spring through frost, and with some deadheading, the blooming will continue to be heavy. Start the seeds indoors 6 - 8 weeks before the end of frost season. Press the seed into the soil and lightly cover with soil. Keep the seed moist. With a temperature of 70 - 75F, germination is usually within 20 days. Marigolds can bloom from seed in 8 - 10 weeks. Transplant outdoors after danger of frost has passed. Space the plants 8 inches apart. Grow in full sun and in moist, well-drained soil. Marigolds are usually resistant to deer. 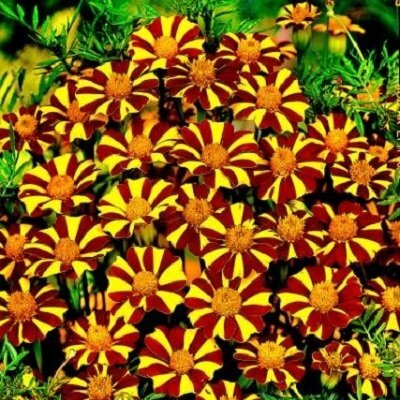 Compare prices on Marigold Seeds at ShoppinGent.com – use promo codes and coupons for best offers and deals. Start smart buying with ShoppinGent.com right now and choose your golden price on every purchase.